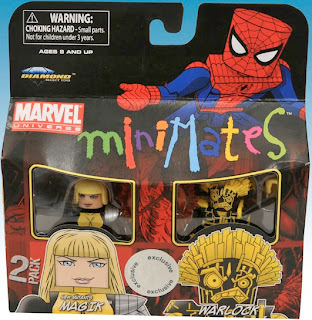 She's Fantastic: Minimate Women of The NEW MUTANTS! 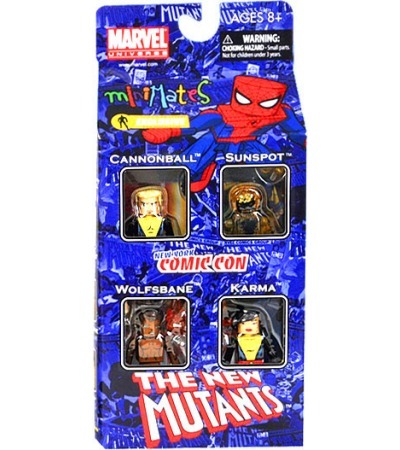 The first set was an SDCC Action Figure Xpress exclusive 4-Pack Featuring Sunspot, Karma, Wolfsbane, and Cannonball from 2011. Let it be noted though, that if you love your minimates and you love this team, you pretty much have to buy two of these sets. I'll explain further on. The second set was a TRU Exclusive 2-Pack from late 2011 featuring Magik and Warlock. Lastly, we have another TRU Exclusive 2-Pack from Spring 2012 featuring Magma and Mirage. First up is the introverted, shy Vietnamese Xi'an Coy Manh, also known as Karma. She has the telepathic power of taking over people's minds and controlling them like puppets. Next up is the shy, Scottish, lycanthrope, Rahne Sinclair, aka Wolfsbane. Wolfsbane came with an alternate Rahne head. This is the first reason why a second set is good. You came use the second Karma body for Rahne's human form. Next up is Amara Aquila, the pulled-out-of-time tectonic vixen: Magma! Next up is Danielle Moonstar, the strongwilled Cheyenne mutant who can show her opponents a vision of their greatest fears. She originally was known as Psyche, but soon changed her name to Mirage. Currently she just goes by her family name, Moonstar. I was extremely happy to see her with her turquoise belt. Her prototype was originally shown with the same red X belt that all the others wore. Dani did indeed wear this standard belt, but only for a short period until she customized her costume with the belt and boots. She comes with the red belt as an accessory. Finally we've come to the fabulous group shot. This is where a little further explanation of the extra boxsets will be detailed. Warlock comes with a Doug Ramsey (Cypher) head that looks great on an extra Cannonball body. Roberto Dacosta (Sunspot) also comes with a "powered down" head that looks silly on his powered-up body. The extra bodies let you display them in all their diverse glory. From Left to Right: Magik, Cyper, Warlock, Cannonball, Karma, Mirage, Magma, Wolfsbane (wolf form), Wolfsbane (Rahne form), Sunspot (Bobby form), Sunspot (Powered-up form). Wow. Just, wow. I've been reading back through your blog for days, since I somehow discovered it (how had I missed it until now?!). As a female action figure collector and a former DC penciller, nothing is closer to my heart than the figures you've reviewed. And now, you have written a post celebrating my most cherished team ever. Do *you* know what happened with the Legends Dani figure? I feel as if they raised my hopes to the sky, then cruelly dashed them. I haven't been able to find any trace of the figure ever being released *or* coverage of the rolling change being cancelled. Please tell me you know the answer, so I can have closure!! I spent many hours searching for the Marvel Legends Dani on eBay in the past few years. To my knowledge, no, she has never been released. For that matter neither do a lot of Marvel superheroes. We never saw the Lyra variant of She-Hulk. We never got Northstar to pair up with his twin Aurora. Not to mention all the recently-announced ladies that have uncertain futures: Rogue, Songbird, White Phoenix, etc. Then again, They found a way to get us Valkyrie years after she was "cancelled", and the upcoming Jubilee received the same reinstatement. But Moonstar never even had prototypes leaking from the factories in China. I don't think she ever made it past the paint master phase. And as much as I love the character, I wasn't terribly dissappointed when this figure seemed to get the axe. I thought the figure was a poor representation of Dani; too thin, awkward articulation, stiff looking hair, etc. Now that Hasbro has created at least two updated female bucks (Spider-Girl and Moonstone), I think using the markedly less impressive "Maria Hill" body that her prototypes were shown on would be a major disservice. As far as Hasbro officially saying the Moonstar variant was cancelled, I don't believe they ever did. But they've never been especailly good at owning up to their failings. Last mention of her that I remember was several years ago saying "we are working very hard to get these figures onto the shelves." I have zero expections though. I hope we see a New Mutants box set in the future with a new Dani. I don't think it's far fetched. In the past few years we've seen the Original X-Men, new X-Force, Thunderbolts, and Inhumans in boxsets. The New Mutants would make an amazing convention exclusive. Anyway, thanks for finding my blog! I don't do anything to advertise it so I only get moderate traffic, but I know when true kindred spirits stumble in they'll really enjoy the obsessions of a fellow enthusiast.. A couple weeks ago I hit 400 posts and it kind of stunned me a little. The sheer number of written words there is enough to fill two novels. I plan to keep it up for many more years so hopefully you'll be seeing my review of a Legends Moonstar when she finally hits the shelves!